Kate qualified at Liverpool University in 1989 and joined Barker Dental Care in March 2015. 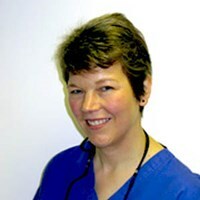 Kate has been practicing in Hampshire for many years and is very enthusiastic about dentistry. She enjoys all aspects of general dentistry but particularly enjoys getting to know her patients, helping them to overcome any anxieties they may have, and working with them to optimise their oral health and achieve the smile they desire. Kate continually strives to perfect her skills through continued education in such areas as occlusion as well as restorative and cosmetic techniques. She is also a full member of the British Academy of Cosmetic Dentistry. Kate has been very popular with her patients, and she will not only provide our patients with high quality private dentistry but also with excellent customer care. Away from work, Kate is kept busy by her daughters, Georgina and Jenny. When time allows she enjoys badminton, swimming and going to the gym along with reading, attending the theatre and opera.